It’s hard to present a “Top Places to Eat” article for Bali let alone Ubud that satisfies all, because the divide between locals and foreigners is too great. What’s mouthwatering for expats and tourists is probably not so desirable for locals who want spices and spicy to the point of numbness. And when I say locals, I mean Balinese locals; Javanese and other Indonesians have different preferences as well, and they have their own list of go-to eateries in Bali. What I present here is a list that contains restaurants, warung (food kiosks), and everything in between, some liked by foreigners and others liked by locals, and in rare occasions, liked by all! The common theme is that all of these joints serve food that is better tasting and fresher than their equivalents. Here I only share some of my favorite eateries; my other preferred spots will have to wait for another post. If you have tried or do end up trying one of these places, leave a comment and let me know what you think! Serves grilled/fried fish or chicken with sambal matah (chili in coconut oil with chopped shallots, AKA my favorite chili ever) that is finger-lickin’ good. The fish is always fresh, and I recommend getting your meat grilled pedas manis, which literally means “sweet spicy”. It’s a marinade blend that will get you going back there again and again, as my colleagues and I have done. There are many joints selling ayam/ikan bakar at this price but this is by far the superior choice. Serves a mean nasi campur, which is a mix plate of house specialties. This comes with two flavors of spicy chicken, a chicken satay, vegetables, gizzards, and peanuts. Does the last two items sound strange? But they’re so delicious together, and the number of customers this place draws in on a daily basis proves it. Owned by a local family who still lives in the premises, this place is one of the prides of Kedewatan and is in many must-eat lists for many domestic tourists. Very close to this place you will see many kiosks bearing the name “Nasi Ayam Kedewatan”, but you want to make sure you go to Ibu Mangku’s. I come here for the same two dishes again and again. They are so good that I’ve never even bothered to try the rest of their menu, which I have been told is equally wonderful. 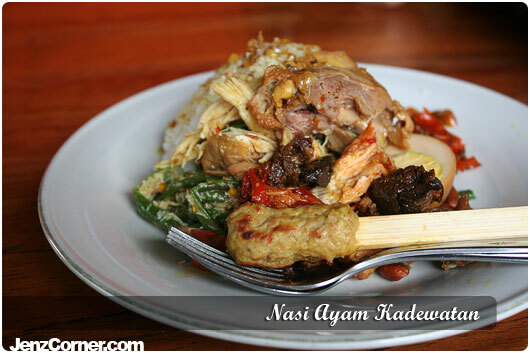 These two dishes are the Ayam Asap Goreng and Bebek Bakar, both of which are in their recommended menu. The former is deep fried smoked chicken, an ingenious process that sounds unusual but results in one of the best chickens I’ve had. The latter is grilled duck; I think the crispy duck is what they’re known for but as I’ve previously mentioned, I prefer meats grilled in Bali because the Balinese know how to grill. I’ve taken every single visiting family member and friend here, and in turn they introduce this place to other family members and friends. This slightly higher-end place gets the breeze from rice paddy fields next door, a perfect combination of modest and elegant. Great place to impress guests or have a low-key celebration. I’ve only been to this charming little place once, but the food was so memorable that I have been speaking in exaltations about it to friends before making a second visit. The food they serve is how I believe authentic Japanese food should be cooked, and that my Japanese boss frequents here with his Japanese drinking buddies makes me believe I am not irrational to think so. They don’t serve sushi or izakaya-style dishes, but the menu still offers a great choice of traditional Japanese food. They also list where each ingredients comes from, which is unheard of here. The story behind Warung Sovia involves a Japanese lady who moved here awhile ago and wanted to share Japanese home-cooking with people here at an affordable cost as well as impart her handed-down family recipes to her children, or so at least that’s what I remember from the menu. The lady is still always there, cooking away in a cute apron and with an even cuter smile. She uses all local ingredients and tries her best to not import any ingredients from Japan, so her dishes become very interesting renditions of traditional Japanese dishes. Regardless, it still tastes so Japanese to me and so good! I need to be clear that this Italian restaurant is owned by a Japanese (there are many stray Japanese in Ubud), but this place serves really great pizza and pasta–better than the ones in other Italian restaurants I’ve tried here. If you think Pizza Bagus has tasty pizza, try Cafe Fiore Citta and think again. My boyfriend always gets the Pizza Japones (mozzarella, eggplant, arugula, shimeji mushroom, and cherry tomatoes) while I always order the Spaghetti al Salmone (with homemade cream sauce, shimeji mushroom, and salmon). We love it. I get regular cravings for the spaghetti, and we’re lucky that this place has a nice and romantic ambience, good for dinner dates! This entry was posted in Bali, Taste and tagged eating in ubud, top places to eat in ubud, ubud eats, ubud restaurants, ubud warung, where to eat in ubud. Thanks! Follow me @cindiot. Unfortunately I won’t be updating about Bali anymore since I’ve moved, but not to a bad location either…I am now in Honolulu, lucky. We’ll be relaunching the blog in 2013, so no worries we will have new updates soon. Thanks so much for keeping up with us! Almost forgot, follow @herbandlace too!